Imagine yourself examining species of coral in Fiji. Looking at fungi and parasites in grass seeds. Following ants across the ground up close, or picking out the striations in a piece of roast beef on rye. People around the world are doing all this and more with a tiny, durable magnification lens built by an enterprising University of Washington undergraduate student. The Micro Phone Lens, developed by UW mechanical engineering alumnus Thomas Larson (’13), can turn any smartphone or tablet computer into a hand-held microscope. The soft, pliable lens sticks to a device’s camera without any adhesive or glue and makes it possible to see things magnified dozens of times on the screen. “A microscope is a tool you can do thousands of different things with and by making it cheaper, portable and able to take pictures, you open so many different possibilities that weren’t available before,” Larson said. The lens is about the size of a button and comes in its own carrying case. Users stick it flat onto a smartphone camera lens, turn on an external light source such as a lamp, then run the device in camera mode. Moving the device closer or farther from the object brings it into focus. 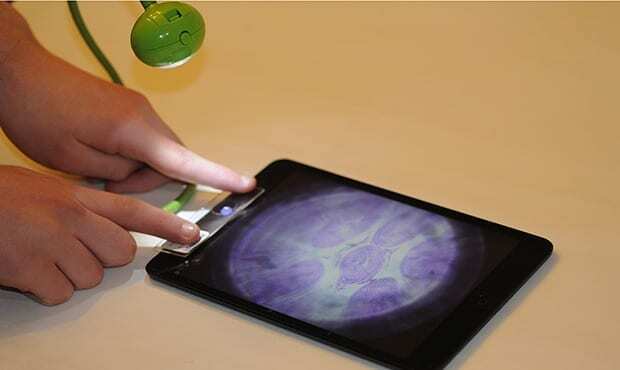 Several other products exist that can adapt a smartphone to be used as a microscope, but they are significantly more expensive, and the attachments are heavy or require permanent adhesives. Larson developed his smartphone lens while working in the lab of Nathan Sniadecki, a UW associate professor of mechanical engineering. The lab needed a miniaturized lens that could work with a cellphone as a microscope, and Larson took on the project. The lens he developed is now as powerful as the research microscopes used in the lab, Sniadecki said.